So how could you know me at all? If I could plant a winter blossom, would it make you think of me? When you saw you were succeeding, did you feel a pang of shame? You may have heard or read of the Greek myth of Persephone. She's said to have been carried off by the King of the Underworld and held there for a time against her will. Because she ate four pomegranate seeds while she was there (or three, or six, depending on which version you happen to be reading), she became bound to return there for four (or three, or six) months out of the year, during which time her mother, Demeter, let the earth fall barren in her grief for her daughter. But what if that's not how it was? What if it wasn't a kidnapping? What if she really loved him? "Persephone" is, essentially, about falling in love with someone who's not right for you. I was actually in a relationship like that when I started writing it, though at first I didn't think about the song idea quite so personally. In the beginning it was just an abstract idea what if Persephone had actually fallen in love with Hades, and run away with him? What would that be like? The idea was appealing. The daughter of the goddess of summer, nature, fertility, all that sunny and green sort of thing, in love with the king of a dark, cold, barren, underground place. They're about as incompatable as you could get, aren't they? And the idea appealed more as it became less abstract and more personal. I'm not claiming to have dated Hades or anything, but it was becoming clear we weren't compatible, and here was a big fat juicy metaphor ripe for the plucking. I didn't finish the song until after the relationship ended; there's a time-honored tradition of songwriting as therapy. There are a few personal references, but mainly the thing is just painted in broad strokes of metaphor he can never change to be like her, and she can never change to be like him. Night and day, light and dark, summer and winter. Winter. That was really the hook. In a long-distance relationship, the majority of the time we'd spent together had been during cold weather late fall, winter, or very early spring. It was just a coincidence, an accident of scheduling, but it made for interesting songwriting fodder. I'm a creature of sunlight, really; I'm at my best and happiest during the long summer days when sunset's at nine or ten, and I need my living spaces to be bright and sunny for best results, give me a sunbeam to curl up in. "You only knew me in winter / so how could you know me at all" seemed like the perfect frame on which to hang the rest of the song. Persephone was something that materialized in spurts over the whole of the album's production period. Although the chords and song structure existed as-is before I came onto the scene, the individual instrumental parts for the Thirteen version were written and recorded in chunks. It was a lot of work getting it just right. The chords for the basic background guitar were written by Vixy before we were partners, and were already performed in essentially the same style by Fishy, back when they were still Escape Key. Very early on (in fact it was among the first things we recorded for this album), I painstakingly re-recorded those same chords to a click track on the steel string, modifying the arpeggios so that the chord changes sounded comfortable and there weren't any note-stoppages as I switched chords. I wrote the second layer of guitar (the leads/fills) by just improvising directly into the recording software, one section at a time. I originally recorded them all on steel string and later re-learned them off the recording and redid them all in nylon-string, to get that clear definition between the two parts. I actually bought a new nylon-string guitar just for recording that part, since my existing one had terrible intonation and couldn't stay in tune. Vixy and I collaborated on writing the bass line, writing it a note at a time in MIDI, a maddening process which made Vixy want to strangle me several times. But we persevered and came up with a melody that pleased us both immensely. It was very nonstandard and didn't have a real "rhythm" to it, but rather did a meandering melody that complimented the other instruments. Someone later told us that's called a "non-walking bass line". 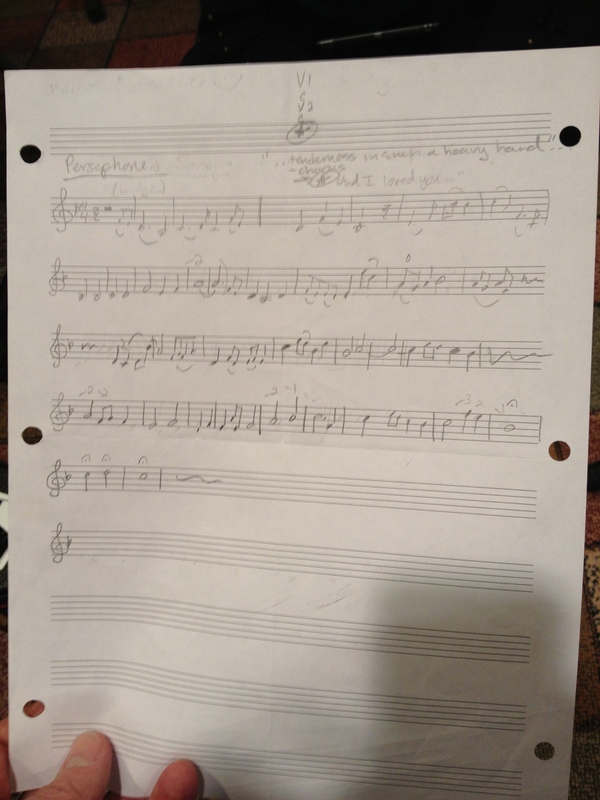 We printed out the MIDI notes as sheet music for a real bassist. We had intended the bass line to be recorded by Douglas McCorrison, and he even came in and tried doing some tracks, but what we recorded that day ended up being not usable for various reasons. I was very sorry about that, because I really wanted to use Douglas on the album, and he went out of his way to learn the part and do it for us. Sometimes in production, things like that happen. Near the end of production, at the last minute, I handed the sheet music to Chris Clark (the bassist on Thirteen and Erased) and he did the fantastic take that you hear on the final track. Processing the sound of Chris' upright acoustic bass to make it fit with the song was very tricky in this particular case, even though the same bass dropped right into Thirteen and Erased with nary a problem. Sometimes you never know about these things. All along, I'd envisioned that a violin should appear on the bridge, very dramatically. When Sunnie Larsen came in to play the part, it was the most amazing thing. She had nothing prepared ahead of time, she'd done all her preparation for Mal's Song and had come in expecting to record only that song. She didn't want to improvise something for Persephone, so during about 15 minutes of listening to repeated stop-and-start playbacks of the song, she wrote (and I mean wrote with a pencil straight from her head onto sheet-music paper, Amadeus-style) the entire violin part, which she then took over to the music stand and recorded flawlessly, sight-reading from the sheet music she had just written. It was probably the most amazing thing I've ever seen anyone do in the studio. The trouble with writing a song about something personal you're going through is that eventually, you get over it. To perform any song effectively, you have to get the emotion across, and to do that, you have to feel it, at least a little bit. Otherwise you're basically just reciting words, and your audience feels the difference, even if they don't realize what it is that they're hearing/not hearing. This made recording problematic. We did several takes of the final vocal, and they were technically proficient enough, but... kinda lackluster. They didn't sound right to me, and I was getting frustrated. I knew why, of course. I wrote the song years ago; it's all over now. To work on the song properly, I needed to get back into the emotion of it. I'd have Tony stop talking to me for a minute, close my eyes, and call to mind all the things that had been the impetus for writing the song at the time. Then I'd open my eyes and say "hit it", and get a quick take while it was all still fresh in my mind. It worked, and when we were choosing which takes to use for the final mix, I deliberately left in a bit here and there where there was a wrong note or a slight vocal wobble, because it was the better performance emotionally. Though the technique was incredibly effective, the downside was that whenever we were working on this song, I was bitchy and irritable as a result. I'm not kidding when I talk about how lucky I am to have Tony as a producer; I don't know anyone else who would've put up with what he's had to put up with. Ah well... it's sort of like complaining that the $100 bill you just found on the ground is too wrinkled.